Loretta is a shy little Chi girl! 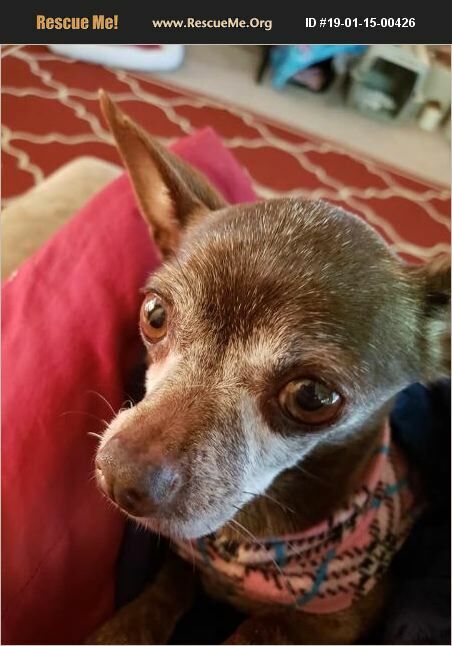 She is a 7 year old Chihuahua who weighs about 4.5 pounds. She came to us from a hoarding situation and she hasn't had much positive human interaction until now. She is very timid and quiet and tries to hide herself away most of the time. She is a bit fearful of new people and is a little tentative at first, but she does warm up to you as long as you let her come to you in her own time. Once she is settled she loves to be close to you and will sit in your lap any chance she gets. Loretta gets along with other dogs at the foster home. She doesn't want to play with them but she doesn't mind them at all. She hasn't been tested with cats or with kids and we don't recommend small kids due to her age and her size. Loretta is up to date on all her shots and is heartworm positive. We recommend the slow kill treatment for heartworm as it is the safest treatment. It is simple and inexpensive and just requires one Advantage Multi every month, the same as you would give for a monthly preventative treatment. The adopter must agree to continue this treatment and the rescue will pay for testing every 6 months until she tests negative. In our experience,this is usually about 6 months. Loretta is housebroken and trained to use a puppy pad in the house if she doesn't have access to outside. It makes us sad that she has never really known what it is to be a beloved pet and we look forward to her finding a loving furever home of her own soon.